A seperate ladder (rather than rungs) makes for safer access. Ensol tank owner David Stewart. Adequate and reliable fuel storage is an essential component in helping farmers to run their businesses efficiently and without interruption. 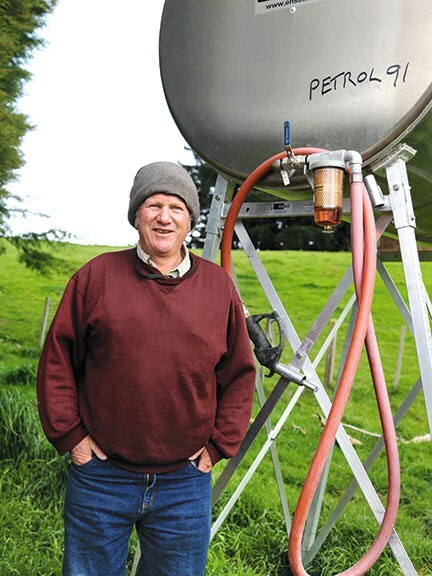 When Hawke's Bay farmer, David Stewart wanted to increase the fuel storage on his farm he asked his supply company Rural Fuel what they recommended. 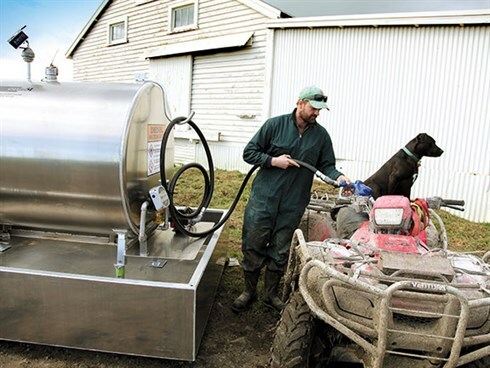 They suggested an aluminium tank made by Palmerston North firm Ensol Ltd.
Stewart's shiny new 1600-litre tank is situated beside a sheltering hedge near his farmhouse and beside a laneway leading to the rest of the farm. It was installed in July this year. He previously had a dual purpose, petrol and diesel on-ground, steel tank with a combined holding capacity of 2000-litres. Stewart, who has a 1400ha beef, sheep and cropping farm explains the reason for the upgrade. 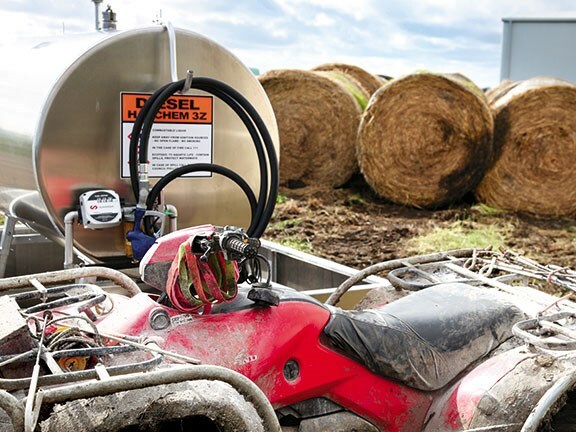 "We run five quad bikes that use 1200 litres of fuel in August and September at lambing time. We previously stored 1000 litres of petrol and it just wasn't enough for us. Over the whole year we use more petrol than diesel: on average, per month we use 600-800 litres of petrol." There are several features of the tank that he is pleased with. "Not only does it look great but the fuel truck drivers like it because it has a strongly built access ladder. It has to be one of the best ladders I've seen on a tank. It's safer and sturdier than many others and I reckon that's one of its best points." Another feature he likes is that the tank is gravity fed and therefore quick to operate. His older tank (which he also now has on a stand) used to sit at ground level and also required a hand pump. 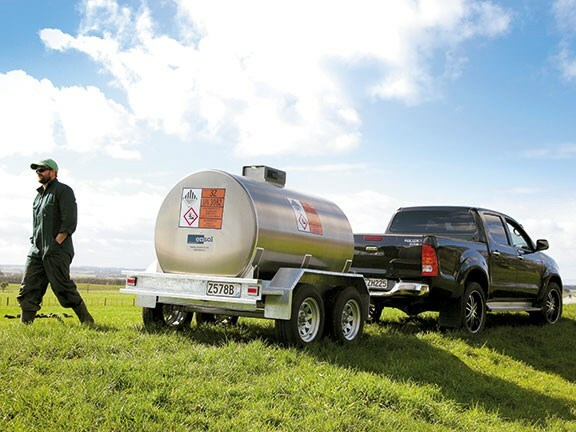 Having a large quantity of fuel on-hand means Stewart can get on with business without worrying whether he has enough for the farm's day-to-day requirements. He likes the fact that "apart from changing fuel filters," he doesn't have to do much else, except to phone Rural Fuel for his monthly order. 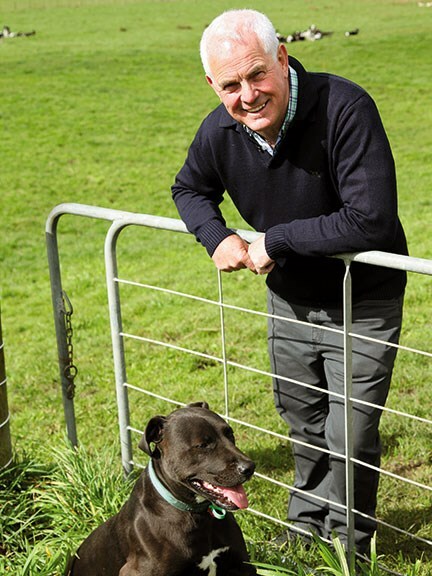 Stewart has farmed practically all his life on the same farm near Flemington. It was originally a rehabilitation farm that his father drew via ballot at the end of World War II. Stewart recalls how in the past, fuel was stored in 20-gallon drums, requiring frequent trips to town (a 30 minute trip) to get more. "We used to fill up drums in spring and autumn. Now I have 3500 litres of stored diesel on this farm and at another property 5km up the road. "When I do agricultural work on the tractor, sometimes that's not enough; a tractor can go through close to 200 litres a day." Ensol Tanks owner, Larry Ellison began designing and manufacturing Ensol Tanks for a specific reason. "I saw a need to design a new type of fuel tank, not only for health and safety reasons, but also to produce a state-of-the-art tank that didn't rust from the inside and would protect the fuel," he says. Quite simply, his goal was to make the highest quality, longest lasting, best-designed tank in the country. As the former owner of Rural Fuel and with 25 years’ experience in the fuel industry, Larry is well qualified. "I have a good understanding of what is required as far as safety issues go, for example, with tanker drivers having to climb up tanks to fill them. I noticed problems with mild steel tanks; when they were located close to the coast, they rusted out within months. "Therefore, I knew they couldn't be manufactured using mild steel. I looked at stainless steel and aluminium, then went to an engineering firm with a few sketches and asked if they could engineer a marine grade aluminium fuel tank for us. We then got approval to manufacture them in New Zealand." Ellison and his wife, Jane set up their own engineering firm Ensol, (Engineering Solutions), to manufacture this type of tank, simply because no one else was doing it. That was in 2006 and Ellison says Ensol tanks have now become the tank of choice for many rural businesses. He describes them as a tank for life. "They will never rust and they can't wear out," he says. Ensol tanks have departed from the more common three-legged tripod design. "We designed them with four legs and placed them further out for stability. A well-known engineering firm has done EQ stability tests, so that is why they sit on the ground on concrete pads. 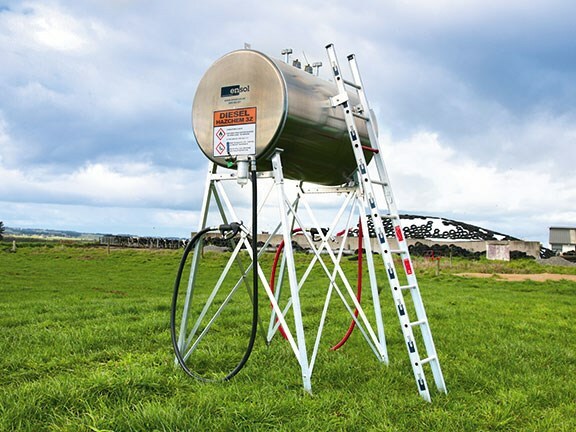 "We then added a double ladder (with a New Zealand safety rating), leaned it at a certain angle and bolted it to the tank. Instead of climbing pegs, this means drivers climb up a ladder. The ladder is higher than the tank so they can hold on at the right angle. Consequently, they are a whole lot safer." The feedback from drivers is that they feel more secure when climbing up to refuel. Ellison says Ensol's core market is the rural sector but they're also aiming for other rural sector contractors, such as fishing companies, orchardists and transport firms. "We have some large clients with large tanks. A number of tanks such as those on a wharf at Taranaki have a combined storage of 10,000 litres." Ellison has also designed Levno, a solar powered monitoring device that allows a farmer to track how much fuel is in his tank, who is taking it out and when. It doesn't need power or mobile phone reception. Levno collects and transmits data over the mobile phone network or via satellite. Again, Levno was the answer to a need. "Farmers were losing fuel and wanted to monitor when it was going out of their tank. They also wanted to make sure they didn't run out. The fuel company also has access to it; they can dial in and see how much fuel you have and when you need it delivered. Every component is built to last: legs, bracing and ladder are all constructed from rust-free marine grade aluminium. All bolts and valves are nickel-plated brass or stainless steel. Ensol produces two different types of farm tanks: above-ground, gravity fed tanks and on-ground tanks with pumps. Ensol tanks range in size from 700- to 1900-litres. 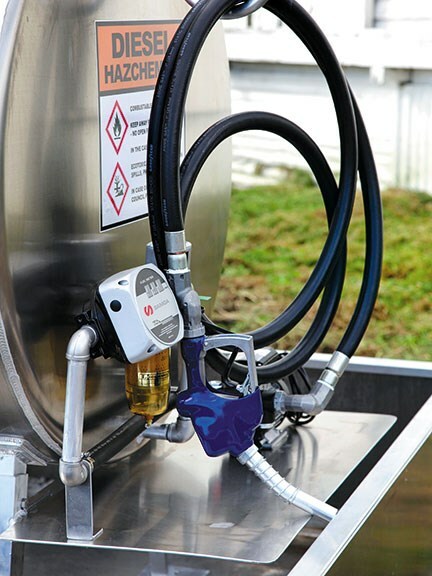 Both styles of tank are available as single use tanks, designed to hold either petrol or diesel, or as combination tanks, which are divided to enable safe storage of both types of fuel within a single unit. 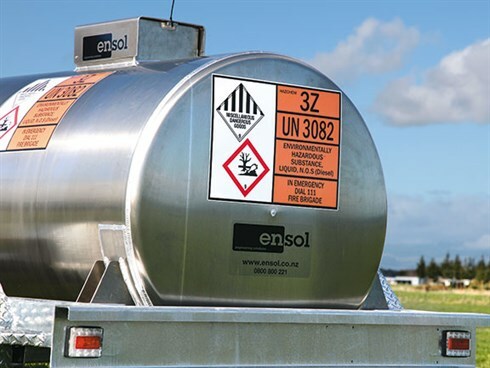 All Ensol farm tanks are ERMA approved and comply with the HSNO regulations. 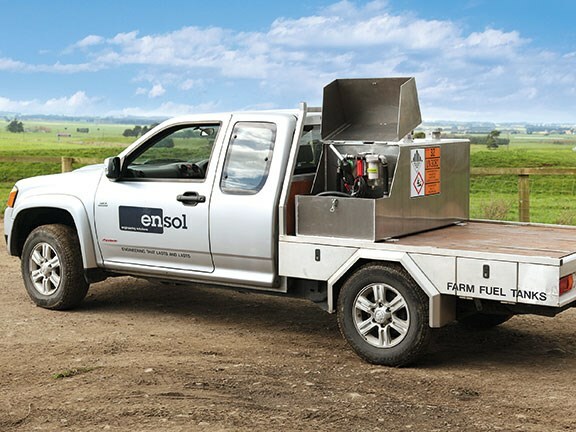 Ensol gives a ten-year guarantee on workmanship on all static farm fuel tanks. For the latest reviews of farm machinery, subscribe to Farm Trader magazine here.